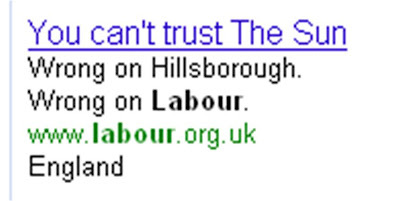 The Sun and Labour - Google FIGHT! Last night after Gordon Brown's Labour party conference speech, the UK's largest newspaper, the Sun, declared that it is backing David Cameron and the Conservative Party at the next election. The Sun has supported Labour since 1997 and in damning, vitriolic editorial it laid out the case against Gordon Brown in todays paper in a 'Dossier of Failures'. All of this is then reprised online with comment from all the Sun's columnists, graphics and further expansion of the theme of 'Failed.' There is even video footage of the Sun turning blue and a seperate section called www.thesun.co.uk/feelingblue. This is another indication that online will be a key battleground in the forthcoming UK election. It is also interesting to note that whilst tough restrictions apply to the use of media for UK political party advertising (eg no broadcast ads), these rules have not been sufficiently updated to cover the new online areas of social networks, internet video and the like. Whilst I would like to have our nursery vouchers back, the point of this post is not to voice political opinion. I'm intrigued by the Sun's announcement today (especially the full-blooded aggression in the way it is written) and think it will be interesting to see what happens on Google during the Conservative Party conference next week.